Due to complexity of the plasma proteome, it represents one of the most challenging proteomes to analyze. In order to detect low abundance proteins, time consuming two-dimensional separation techniques such as antibody-based depletion methods in combination with SCX chromatography are often used prior to LC/MS analysis. In this study, a faster and simpler one-dimensional separation workflow using the Genway IgY-14 plus SuperMix depletion columns were developed. These methods were evaluated by a protein spiking experiment and an Alzheimer’s disease biomarker study. Each method was tested for the detection of low abundance plasma proteins as well as additional analytical criteria such as number, reproducibility and intensity CV of detected peptides, and total processing and analysis time. A pool of human plasma was spiked with five non-human proteins (Ovotransferrin, Alcohol Dehydrogenase, Phosphorylase B, Beta-galactosidase and Hexokinase) at eight concentrations ranging from 2 pg/uL to 100 ng/uL. Samples were processed by a one-dimensional (1-D) and a two-dimensional (2-D) separation workflow (Figure 1). 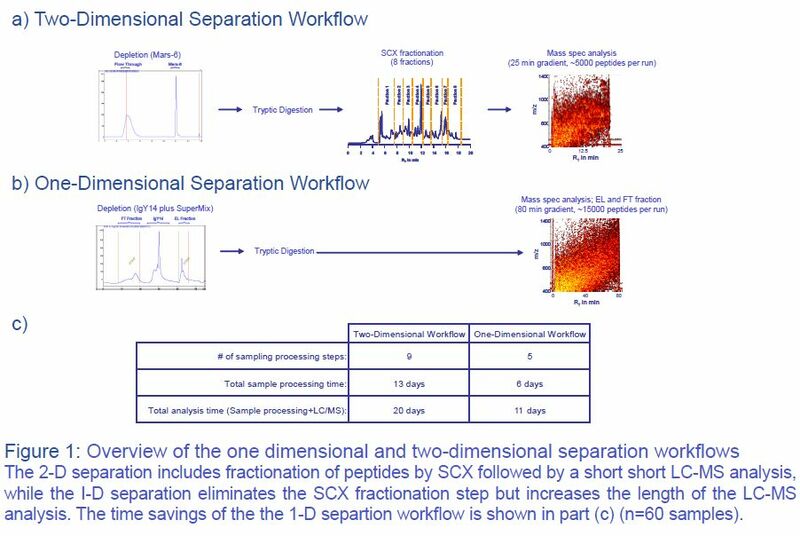 For the two-dimensional separation workflow samples were depleted in triplicate using the Agilent MARS-6 depletion column. Depleted samples were digested with trypsin, desalted and fractionated by strong cation exchange (SCX) chromatography into eight fractions prior to LC-MS and MS/MS analysis (25 min gradient). For the one-dimensional separation workflow samples were depleted using the Genway IgY-14 plus SuperMix depletion columns. The flow through fraction (Proteins binding neither to the IgY-14 and SuperMix depletion column) and eluate fraction (Proteins binding to the SuperMix depletion column) were collected, digested with trypsin, desalted and analzyed by LC-MS and MS/MS (80 min gradient). For the biomarker study, plasma was analzyed from four groups of patients 1) Alzheimer’s disease untreated, 2) Alzheimer’s disease treated (donepezil), 3) Mild cognitive impairment, and 4) Healthy individuals. There were ten samples in each condition. Samples were processed with either the one- or two-dimensional separation workflow as described above. All data was analyzed using in-house developed software as well as with commercial statistical analysis packages. Exclusion MS/MS runs of a pooled plasma sample identified 304 unique proteins for samples processed with the 2-D workflow and 542 unique proteins for samples processed with the 1-D workflow. After the 1-D separation 472 proteins were identified in the Flow Through fraction and 169 proteins in the Eluate fraction, while 99 proteins were identified in both fractions (FT and Eluate). For the AD biomarker study increased intensity CVs were observed for the FT fraction of the 1-D separation workflow as compared to the EL fraction and the 2-D separation workflow (Figure 3a). In addition, the FT fraction showed a set of peptides which were non-reproducible for the analyzed samples (Figure 3b). Expression analysis of the reproducible peptides identified 814 differentially expressed peptides for the 2-D separation workflow. For the 1-D separation workflow 370 differentially expressed peptides were identified in the eluate fraction and 1222 peptides in the flow through fraction (Figure 4a). Generation of Multi-Dimensional Scaling (MDS) plots of the differentially expressed peptides allowed the separation of the different patients groups with both workflows. MDS analysis of the FT fraction of the 1-D separation workflow is shown in Figure 4b. Differentially expressed peptides were targeted for sequencing by tandem mass spectrometry for the identification of over-expressed proteins. Several proteins were identified with known Alzheimer’s disease link such as properdin, mannose binding protein, calmodulin, carbonic anhydrase, clusterin, serotransferrin and transthyretin. The non-reproducible peptides observed for the FT fraction was hypothesized to come from low molecular weight compounds endogenous in plasma. To test this, 10 samples from the AD study were reprocessed, and low molecular weight compounds were removed by ultra-centrifugation (5 kDa cut off) prior to digestion. Results of this experiment are shown in Figure 5. Median intensity CV decreased from 30% to 22%, and an improved peptide reproducibilty was observed for the ultracentrifuged samples. Removal of the low molecular weight compounds prior to digestion appears to eliminate most of the non-reproducible peptides observed for the AD biomarker study. The authors would like to thank Dr. Sergey Sikora (Genway Biotech, Inc.) for providing the IgY-14 and SuperMix depletion columns.